This is a weekly series featuring friends who have met celebs. The baseball season is nearing the end and football season is about to begin. For a couple months, the two sports will overlap, although for most cities (like Chicago), the fans are already concentrating on football. It's not often Chicagoans really have two sports competing for our attention. My friend Jim is a huge fan of both the Chicago Cubs and the Bears. Even he has turned his thoughts to the Bears now. 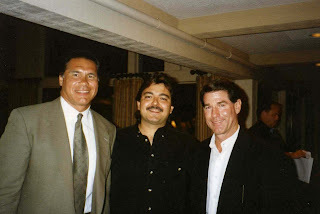 Several years back though, he was caught dividing his attention between former a former football star and a former baseball star...Jim Plunkett and Steve Garvey. Plunkett was a Heisman Trophy winner, Super Bowl MVP and NFL Comeback Player of the Year. He lead the Oakland Raiders to two Super Bowl victories. Garvey was an NL MVP, ten time All-Star, four time Gold Glove winner and a big part of four World Series teams (winning one championship). He finished with 2599 hits and a .294 average. Jim was happy to meet these two legends (even though Garvey went to Michigan State, rival to Jim's beloved Michigan). Unfortunately, Jim didn't have any major awards to keep up with the two men. I know Jim won one of our Football Confidence Points Pool, but that just doesn't have quite as much cache as the awards these guys won. Still, Jim stood proudly knowing that with or without the major hardware, he doesn't take a backseat to anyone! Jim Plunkett, Jim Gekas and Steve Garvey in Itasca, IL-Late 1990's.